Hotel Galvez & Spa®, A Wyndham Grand® Hotel, has partnered with Yaga’s Entertainment to offer exclusive experiences, including wine flights, a weekend package, and a special brunch, in conjunction with the Seventh Annual Galveston Island Food & Wine Festival. Beginning Monday, April 11, through Thursday, April 14, Galvez Bar & Grill at Hotel Galvez will feature special wine flights at its bar and restaurant. Guests can choose between four different flights that include a selection of three vineyards per serving as part of Wine Week. Selections include a light-intensity red, a full-intensity red, a medium-intensity white and sparkling wines. Flights range in price from $12 to $18. Galvez Bar & Grill is open for lunch from 11:30 a.m. to 2 p.m. and dinner from 5 to 10 p.m. The bar is open from 11 a.m. to midnight and also offers bar bites. For restaurant reservations, book via Open Table or call (409) 515-2145. Hotel Galvez & Spa has also partnered with Yaga’s and The Grand 1894 Opera House to offer an All-Access Weekend with Chef Robert Irvine during the seventh annual Galveston Island Food & Wine Festival. The weekend package, available Saturday, April 16, through Monday, April 18, offers two tickets to Saturday's Grand Tasting at the Galveston Island Food & Wine Festival, Sunday brunch for two at the Hotel Galvez, two tickets to see Robert Irvine LIVE! on Sunday, April 17, at The Grand 1894 Opera House, and a post-performance meet and greet opportunity with Chef Irvine. The weekend comes to a close with breakfast for two on Monday at Hotel Galvez. Package rates are from $469/night. For details, visit www.HotelGalvez.com (see special offers) or call (409) 765-7721. To celebrate the Galveston Island Food & Wine Festival, Hotel Galvez will feature special menu items created by Executive Chef Lance Fegen of Liberty Kitchen & Oyster Bar on Sunday, April 17. 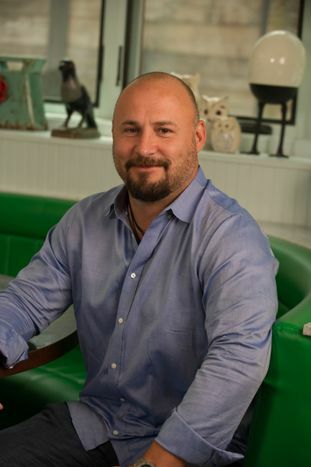 Fegen is co-owner of BRC Gastropub, Liberty Kitchen & Oyster Bar, Petite Sweets and Little Liberty in Houston as well as Liberty Kitchen in Austin. In addition to the standard brunch menu, this special Food & Wine Festival brunch will feature Chef Fegen’s Hawaiian Pokē Station with Pupukea-style tuna & tako and classic Shoyu salmon served with cucumber and warm white rice base. Guests can request custom add-ins for the entrée, including mango, furikake, wasabi peas, avocado, chiles and seaweed. Cost of brunch is $42.99 for adults, $37.99 for seniors, $26.99 for children ages 6-11 and complimentary for children under 6. For brunch reservations, book via Open Table or call (409) 515-2145. Hotel Galvez & Spa®, A Wyndham Grand® Hotel and National Trust Historic Hotel of America, is the only historic beachfront hotel on the Texas Gulf Coast. This 224-room, century-old hotel offers 13,000 square feet of meeting space, a 9,763-square-foot spa, fitness center, full-service restaurant, lobby bar, pool with a swim-up bar and Hall of History. The hotel is rated four diamonds by AAA and is owned by the Cynthia and George Mitchell family as part of Mitchell Historic Properties. For reservations, call (409) 765-7721, or visit www.HotelGalvez.com. The Galveston Island Food & Wine Festival is coordinated by Yaga’s Entertainment and offers a week of wine tastings at local restaurants leading into a weekend of events including its Premium Tasting on Friday and Grand Tasting on Saturday. Wine and food enthusiasts will have the opportunity to sample wines from around the world, food items from area restaurants, enjoy live music and browse vendor booths. For information, visit http://www.galvestonfoodandwinefestival.com/. The Grand 1894 Opera House serves as a performing arts venue, a community gathering place, and as a historic treasure of Galveston and the State of Texas. Listed in the National Register of Historic Places; The Grand is the official opera house of the State of Texas and one of Texas’ oldest theaters of its era, presenting a year-round performance schedule featuring Broadway musicals, national and international stars of stage and screen, music, drama, dance, concerts and more. For information, call 409.765.1894 or 800.821.1894 or visit www.thegrand.com. Wyndham Grand® is an ensemble of distinguished hotels that are approachable by design, representing one-of-a-kind experiences in key destinations with refined accommodation, attentive service and relaxed surroundings. A part of Wyndham Hotel Group, the Wyndham Grand family currently consists of 33 locations in eight countries. Additional information is available at www.wyndhamgrand.com. Most Wyndham Grand® hotels are franchised by Wyndham Hotels and Resorts, LLC or its affiliate. Certain Wyndham Grand hotels are owned or managed by an affiliate of Wyndham Hotel Group, LLC. Celebrity Chef Robert Irvine will participate in the Seventh Annual Galveston Island Food and Wine Festival on April 14-17, 2016. Hotel Galvez has partnered with the festival organizers and The Grand 1894 Opera House to offer an all-access weekend with Irvine. To celebrate this year’s Seventh Annual Galveston Island Food & Wine Festival held April 15-17, 2016, Hotel Galvez & Spa, A Wyndham Grand® Hotel, will feature special menu items created by Executive Chef Lance Fegen of Liberty Kitchen & Oyster Bar.